Kazemi Moghaddam, E., Owlia, P., Jahangiri, A., Rasooli, I., Rahbar, M., Aghajani, M. (2017). Conserved OprF as a Selective Immunogen Against Pseudomonas aeruginosa. Iranian Journal of Pathology, 12(2), 165-170. Ehsan Kazemi Moghaddam; Parviz Owlia; Abolfazl Jahangiri; Iraj Rasooli; Mohammad Reza Rahbar; Marjan Aghajani. "Conserved OprF as a Selective Immunogen Against Pseudomonas aeruginosa". Iranian Journal of Pathology, 12, 2, 2017, 165-170. Kazemi Moghaddam, E., Owlia, P., Jahangiri, A., Rasooli, I., Rahbar, M., Aghajani, M. (2017). 'Conserved OprF as a Selective Immunogen Against Pseudomonas aeruginosa', Iranian Journal of Pathology, 12(2), pp. 165-170. Kazemi Moghaddam, E., Owlia, P., Jahangiri, A., Rasooli, I., Rahbar, M., Aghajani, M. Conserved OprF as a Selective Immunogen Against Pseudomonas aeruginosa. Iranian Journal of Pathology, 2017; 12(2): 165-170. 1Dept. of Microbiology, Faculty of Medicine, Shahed University, Tehran, Iran. 2Molecular Microbiology Research Center, Faculty of Medicine, Shahed University, Tehran, Iran. 3Applied Microbiology Research Center, Baqiyatallah University of Medical Sciences, Tehran, Iran. 4Dept. of Biology, Faculty of Basic Sciences, Shahed University, Tehran, Iran. 5Pharmaceutical Sciences Research Center, Faculty of Pharmacy, Shiraz University of Medical Sciences, Shiraz, Iran. 6Dept. of Physiology, School of Medicine, Tehran University of Medical Sciences, Tehran, Iran. Background & Objectives: Due to the importance of Pseudomonas aeruginosa in severe inpatient infections and high mortality, the need for an efficient vaccine against these bacteria is increasing. In this regard, the general outer membrane porin of the most problematic microorganism P. aeruginosa, outer membrane protein F (OprF), is a good vaccine candidate. Methods:The databank of NCBI was used to retrieve protein sequences recorded for OprF in P. aeruginosa.The current study aimed at investigating the conservation of the OprF in 150 reference sequences, clinical, and environmental strains of P. aeruginosa from different countries via bioinformatic tools.T-COFFEE and PRALINE software were used for alignment. Results: Of these, 134 strains were isolated from clinical specimens and other strains from environmental samples. Evaluation of alignment by the mentioned software clearly showed that this protein was conserved. Antigenicity and grand average of hydropathicity were favorable. Conclusion: Conservation of OprF in all pathogenic and environmental strains of P. aeruginosa indicated that it can be considered as a good immunogen; however, the protectivity of OprF should be validated experimentally. Pseudomonas aeruginosa is an important opportunistic pathogen. The bacteria can cause many problems in health care facilities, especially nosocomial infections. In recent years, P. aeruginosa showed multidrug resistance against routine antibiotics (1-4). Due to the role of the resistance and its ability in environmental adaptation, P. aeruginosa is widely distributed in hospitals (5). This problem is very acute in burn wards of hospitals (1-4). The prevention methods can be the best solution against P. aeruginosa infections (6). In other studies, many antigens such as outer membrane proteins (Omps), lipopolysaccharide, toxins, pili, and flagella are considered as targets for vaccine design (7-8). In recent years, outer membrane protein F (OprF) is known as one of the main factors in the immunity against P. aeruginosa infections (7). OprF has a special role in P. aeruginosa and binds the peptidoglycan to outer membrane. Removing OprF causes reshuffling of the outer membrane structure and morphology of organism (9). Homology modeling of OprF in P. aeruginosa shows that this protein has conserved and hydrophilic areas located outside the β-barrel area (9-11). To the authors` best knowledge; there is no comparative study on the conservation of this protein in a broad spectrum that could encompass a vast majority of the strains reported so far. Today, advances in genome sequencing and the development of biological technologies, created new methods to determine the conservation of antigens via bioinformatics (12-15). The current study designed an in silico approach to compare OprF sequences of the bacterial strains in different geographical regions. Hence, it would be possible to predict the similarity of the amino acid sequences of this protein to those of the strains reported in Iran to design a vaccine against OprF. OprF was searched in protein databank of NCBI (www.ncbi.nlm.gov) to obtain all of its recorded sequences. This search was limited to P. aeruginosa, and the full-length sequences were selected among reference and clinical strains. All amino acid sequences of OprF were retrieved and saved in FASTA format. To perform a more precise analysis on sequence similarity, alignment was run on the selected sequences (from previous step) by PRALINE(16) at http://www.ibi.vu.nl/programs/praline. This server can align up to 500 sequences each constituent 5000 amino acid. Another software with high accuracy for sequence alignment (T-COFFEE) was also employed (17). Some physicochemical properties of proteins play an important role in the antigenicity, epitope, and B-cells stimulation. One of these properties is the charge of protein; ie, acidity or alkalinity. Properties such as molecular weight, isoelectric pH (PI), amino acid composition of the proteins, the number of positively and negatively charged amino acids, half-life of proteins, and protein instability indices were calculated by Protparam at http://web.expasy.org/protparam/ OprF sequence using Acc. No. NP_250468.1 in P. aeruginosa PAO1 (13- 15). The protein antigenicity was examined by VaxiJen(18)at http://www.ddg-pharmfac.net/vaxijen/VaxiJen/VaxiJen.html. Results above the threshold of 0.4 were proposed as antigen. This server can use the physicochemical properties to determine the antigenicity of a protein. Reference strains included 10 strains listed in Table 1. Reference sequences (RefSeq) represent genomic, transcription, and protein sequences of microorganisms that determine its bibliographic information and features. These reference sequences were collected at NCBI from the database and archived in International Nucleotide Sequence Database Collaboration (INSDC) (19). C. Environmental strains included 6 strains. It should be noted that all of these strains were distinct and selection of any strain was according to the geographical area. Information on the clinical isolates of Pseudomonas aeruginosa is shown in Table 2. These results show that the samples were recorded from 2006 to 2014; and most of them were related to the USA. Information about the environmental isolates of Pseudomonas aeruginosa is shown in Table 3. The alignment results revealed that the amino acid sequences of the OprF were fully conserved in all of the 150 strains (data not shown). Analysis of physicochemical properties of OprF by ProtParam software showed that the sequence of mature OprF possessed 326 amino acids (Fig. 1) with a molecular weight of 35250.6 Dalton and an isoelectric pH (PI) of 4.86. The total number of negatively (Asp + Glu) and positively charged amino acids (Arg + Lys) in the protein were calculated as 47 and 32, respectively. Its molecular formula and total atoms were C1528H2356N436O508S9 and 4837, respectively. The instability index (II) of protein was 28.13. Proteins with instability index smaller than 40 were predicted as stable. Grandaverage of hydropathicity (GRAVY) was -0.443. The antigenic probability of OprF was estimated 0.8010 by VaxiJen. OprF is one of the main outer membrane proteins in P. aeruginosa that plays an important role in quorum sensing and biofilm formation. Moreover, the porin function is observed in facilitated diffusion. The most important role of this protein is to connect peptidoglycan to outer membrane, which is very important in cell morphology. Moreover, OprF binding to gamma interferon causes infection distribution(5). The physicochemical analysis showed that OprF is a stable protein. The instability index provides an estimate of the stability of the protein in a test tube. Statistical analysis of 12 unstable and 32 stable proteins revealed that there are certain dipeptides with significantly different occurrence in the unstable proteins compared with those of the stable ones (20). It is shown that binding of the antibody to the protein causes deformation of bacteria and it is the loss of biological actions and also block binding of interferon-gamma to the cell (5, 8). The GRAVY value for a peptide or protein is the sum of hydropathy values of all the amino acids (21). The higher negative number of GRAVY of the epitope is more suitable for reacting with antibody. Also, antigen probability estimated by VaxiJen showed that this protein was highly antigenic. Consequently, the protein was considered as a good candidate for vaccine, and production of such a vaccine is in preclinical phase (22). After years of study on the lipopolysaccharide (LPS) vaccine adjuvant, the use of such vaccines failed due to existence of different serotypes of O-antigens (4). Therefore, the main question of the current study was that whether or not such a problem would happen to OprF vaccine. Sequence similarity search was done to reach a conserved region in the sequence. This area should be conserved in all or a vast majority of pathogenic strains. The results of the current study revealed that the protein sequences of OprF in 134 clinical strains were highly conserved. Recently, the analysis of the anti-P. aeruginosa systemic and lung mucosal immunity elicited by a non-human primate-based Ad serotype C7 vector expressing OprF (AdC7OprF) of P. aeruginosa showed that direct administration of AdC7OprF to the respiratory tract resulted in an increase of OprF-specific IgG in serum, OprF-specific IgG and IgA in lung epithelial lining fluid (ELF), and OprF-specific INF-γ in lung T-cells compared to immunization with Ad5OprF, and survival following the challenge with a lethal dose of P. aeruginosa (23). In a study by Worgall et al. (24), employment of a 14-amino acid epitope of P. aeruginosa OprF (Epi8) resulted in boosting of the anti-OprF humoral and anti-Epi8 cellular responses. This evidence suggested that employment of an OprF vaccine may be effective in prevention of P. aeruginosa infections, worldwide. The current study was a part of an MSc thesis financially and materially supported by Molecular Microbiology Research Center, Shahed University, Tehran, Iran. The authors are grateful to the respected research staffs of Shahed University for their help. 1. Owlia P, Saderi H, Karimi Z, Rad A, Bagher SM, Bahar MA. Phenotypic detection of Metallo-beta-Lactamase producing Pseudomonas aeruginosa strains isolated from burned patients. IJP 2008;3(1):20-5. 2. Owlia P, Saderi H, Rasooli I, Sefidkon F. Antimicrobial characteristics of some herbal Oils on Pseudomonas aeruginosa with special reference to their chemical compositions. IJPR 2010:107-14. 3. Salimi H, Yakhchali B, Owlia P, Lari AR. Molecular epidemiology and drug susceptibility of pseudomonas aeruginosa strains isolated from burn patients. Lab med 2010;41(9):540-4. 4. Saderi H, Lotfalipour H, Owlia P, Salimi H. Detection of Metallo-β-Lactamase Producing Pseudomonas aeruginosa Isolated From Burn Patients in Tehran, Iran. Lab med 2010;41(10):609-12. 5. Sharma A, Krause A, Worgall S. Recent developments for Pseudomonas vaccines. Hum Vaccin 2011;7(10):999-1011. 6. Warrener P, Varkey R, Bonnell JC, DiGiandomenico A, Camara M, Cook K, et al. A novel anti-PcrV antibody providing enhanced protection against Pseudomonas aeruginosa in multiple animal infection models. Antimicrob Agents Chemother 2014;58(8):4384-91. 7. Ahmadi H, Tabaraie B, Maleknia S, Pormirzagholi F, Nejati M, Hedayati MH. Immunological evaluation of OMP-F of native Iranian Pseudomonas aeruginosa as a protective vaccine. J Infect Dev Ctries 2012;6(10):721-6. 8. Priebe GP, Goldberg JB. Vaccines for Pseudomonas aeruginosa: a long and winding road. Expert Rev Vaccines 2014;13(4):507-19. 9. 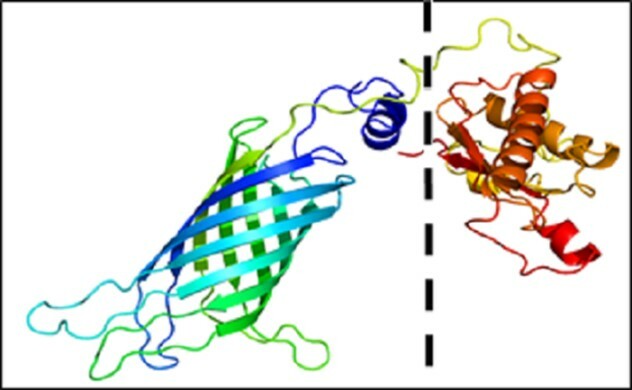 Ding B, Von Specht B-U, Li Y. OprF/I-vaccinated sera inhibit binding of human interferon-gamma to Pseudomonas aeruginosa. Vaccine 2010;28(25):4119-22. 10. Martin NL, Rawling EG, Wong RS, Rosok M, Hancock RE. Conservation of surface epitopes in Pseudomonas aeruginosa outer membrane porin protein OprF. FEMS Microbiol Lett 1993;113(3):261-6. 11. Ullstrom C, Siehnel R, Woodruff W, Steinbach S, Hancock R. Conservation of the gene for outer membrane protein OprF in the family Pseudomonadaceae: sequence of the Pseudomonas syringae OprF gene. J Bacteriol 1991;173(2):768-75. 12. Rappuoli R. Bridging the knowledge gaps in vaccine design. Nat Biotechnol 2007;25(12):1361-6. 13. Khalili S, Rahbar MR, Dezfulian MH, Jahangiri A. In silico analyses of Wilms׳ tumor protein to designing a novel multi-epitope DNA vaccine against cancer. Journal of Theoretical Biology 2015;379:66-78. 14. Sefid F, Rasooli I, Jahangiri A, Bazmara H. Functional Exposed Amino Acids of BauA as Potential Immunogen Against Acinetobacter baumannii. Acta biotheoretica 2015;63(2):129-49. 15. Shahbazi M, Haghkhah M, Rahbar MR, Nezafat N, Ghasemi Y. In Silico Sub-unit Hexavalent Peptide Vaccine Against an Staphylococcus aureus Biofilm-Related Infection. International Journal of Peptide Research and Therapeutics 2015:1-17. 16. Simossis VA, Heringa J. PRALINE: a multiple sequence alignment toolbox that integrates homology-extended and secondary structure information. Nucleic acids research 2005;33(suppl 2):W289-W94. 17. Magis C, Taly J-F, Bussotti G, Chang J-M, Di Tommaso P, Erb I, et al. T-coffee: tree-based consistency objective function for alignment evaluation. Multiple Sequence Alignment Methods 2014:117-29. 18. Doytchinova IA, Flower DR. VaxiJen: a server for prediction of protective antigens, tumour antigens and subunit vaccines. BMC bioinformatics 2007;8(1):4. 19. Pruitt KD, Tatusova T, Maglott DR. NCBI Reference Sequence (RefSeq): a curated non-redundant sequence database of genomes, transcripts and proteins. Nucleic Acids Res 2005;33(suppl 1):D501-D4. 20. Guruprasad K, Reddy BB, Pandit MW. Correlation between stability of a protein and its dipeptide composition: a novel approach for predicting in vivo stability of a protein from its primary sequence. Protein engineering 1990;4(2):155-61. 21. Kyte J, Doolittle RF. A simple method for displaying the hydropathic character of a protein. Journal of molecular biology 1982;157(1):105-32. 22. Mansouri E, Blome-Eberwein S, Gabelsberger J, Germann G, von Specht B-U. Clinical study to assess the immunogenicity and safety of a recombinant Pseudomonas aeruginosa OprF-OprI vaccine in burn patients. FEMS Immunology & Medical Microbiology 2003;37(2-3):161-6. 23. Krause A, Whu WZ, Xu Y, Joh J, Crystal RG, Worgall S. Protective anti-Pseudomonas aeruginosa humoral and cellular mucosal immunity by AdC7-mediated expression of the P. aeruginosa protein OprF. Vaccine 2011;29(11):2131-9. 24. Worgall S, Krause A, Rivara M, Hee K-K, Vintayen EV, Hackett NR, et al. Protection against P. aeruginosa with an adenovirus vector containing an OprF epitope in the capsid. J Clin Invest 2005;115(5):1281.